Jada Toys has for awhile been selling infrared combat cars & trucks in the Battle Machines series, but now they've expanded the line into new areas. 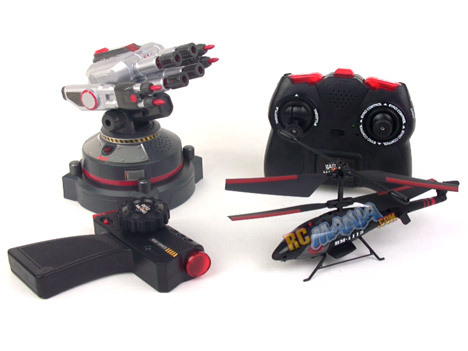 This Air vs. Land set pits an RC helicopter against a ground-based "gun tower" turret. I think the overall idea is insanely cool, but there's a lot of potential for little details to absolutely ruin the fun factor. Let's take a closer look. The helicopter has a surprisingly sleek, aerodynamic fuselage that's fully covered from nose to tail in one very sturdy-feeling assembly. It has a co-axial design (two counter-rotating main rotors) for self-stabilizing properties, and it has 3-channel control, so in addition to the usual up & down and left/right, you get forward/reverse motion thanks to a horizontal tail propeller. The real kicker, though, is that the heli is a gyro-stabilized model. That means there's a motion sensor in it, connected to a little computer-style chip, working together with the motors to keep the craft pointed in precisely the direction you want while it's in the air. The heli charges from the controller, but instead of showing you various non-standardized solid/flashing colored light combinations to indicate charging status, this one talks to you. Audibly. I love that. Intensely. I hate having to check in a manual to see what "red light solid, green flashing turning into both red & green flashing" means. The gun tower unit has a lot of detail, and though the base is stationary like a real ground-based turret, the gun section rotates by remote control, and the four laser barrels flash and have a realistic recoiling motion that looks great. It also has cool sounds. It doesn't have a recharging feature, though -- it comes with three low-capacity AA batteries already in the gun (which lasted through my entire test and longer), and the controller uses two AA's. The turret also has two settings on it, one for heli combat and one for land vehicle combat, so you can use it against Jada Battle Machines cars and trucks. Ok, first off, let me talk briefly about flying the helicopter by itself. In the fewest words, this is one of the best mass-market toy-grade RC helicopters I've tested to date. Thanks to the gyro, it's almost as stable as my all-time favorite Syma S-107G. However, it's a lot tougher. The main rotor blades have some flex to them, so they don't chip or crack when you run into a wall or even a sharp bookcase edge. The closed-up fuselage keeps fingers from accidentally touching or shifting something that needs to be left alone, and also protects all of the electronics & internal wires in a really bad crash. The landing skids are pretty long, so you can land too fast and they will absorb a lot of the impact, but if you're good at flying they make for nicely stable take-offs & landings. What the laser gun tower lacks in mobility it makes up for with a really surprising and unexpected feature -- you don't need to use it. Its own wireless controller lets you rotate it 360 degrees (infinitely -- you can spin around as much as you want) and shoot on command, or you can just hold down the trigger and fire away non-stop. However, if you don't have a second human body in the room to operate a controller, you can put the gun tower on auto mode. It'll rotate and shoot at random. There's no artificial intelligence to it, and it doesn't track the heli, but it moves a lot and very erratically, and it will catch you off guard and shoot your helicopter down. It can turn faster than you can move in the air, and it has a moderately wide field of fire. Pretty exciting. Actual two-player battling is interesting. It doesn't take long to realize that the gun has a cone of airspace above it where it cannot shoot. However, because the helicopter shoots in an area that is angled down diagonally as viewed from the side, when you're flying in the safe area above the gun, you can't shoot it. You have to emerge into the dangerous zone where you can get shot, before you can take a shot. Conversely, when you're controlling the gun tower, you have the ability to turn pretty quickly, but a smart heli pilot can fake you out by appearing to move in one direction, just before reversing quickly in the opposite direction to get off a shot before you can swivel a full 180 degrees. The net result is that both players stay very active the whole time and both strategy and agility are important. The Combat Zone Air vs. Land laser Battle Machines set by Jada Toys is hot. It works way better than I ever expected. The helicopter by itself is an amazing piece of equipment, and it works great. The turret is slightly less impressive on the surface, but as a set together, they are nothing short of greatness. The price feels just slightly high, but you do get a ton of replay value out of the set for either one or two kids. Great parent-child activity, too.